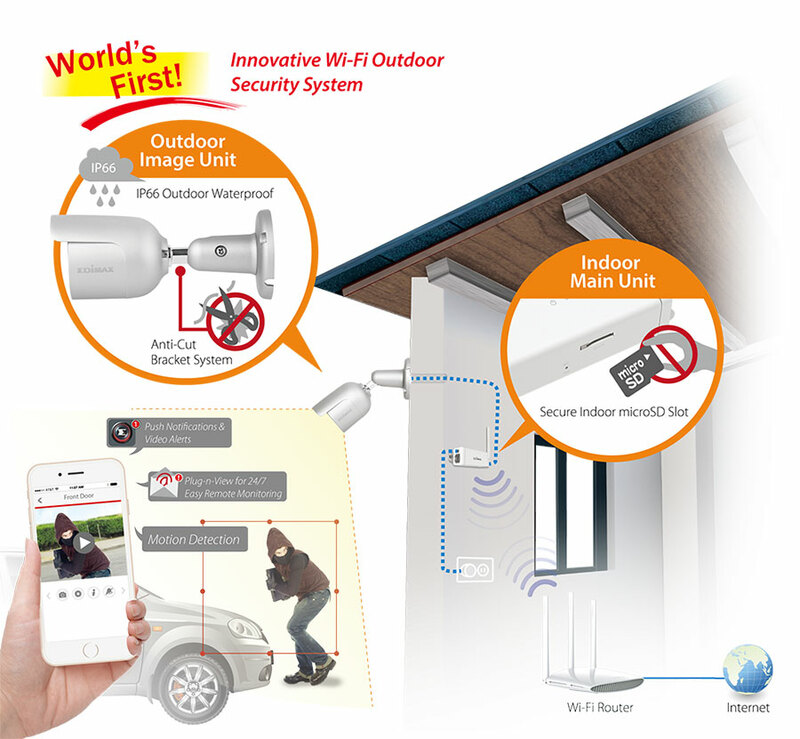 The Edimax IC-9110W is an innovative outdoor network camera with a unique two-piece design featuring an outdoor network camera and an indoor Wi-Fi unit, providing freedom to place the camera anywhere you need. Its a versatile monitoring device ideal for monitoring your home, shop or factory during the daytime or at night. With Edimax Plug-n-View technology, no complicated setup is required and you can easily connect the camera to the cloud and monitor remotely from a smartphone, tablet or laptop. The IC-9110W additionally features a motion detection system and a built-in a microSD/SDHC card slot. Motion detection can be configured according to user-defined areas. Motion-triggered recording ensures that you capture any illicit or suspicious activity and the wireless user interface allows for easy installation and monitoring. The smart and secure design includes an indoor Wi-Fi unit to connect to your router, and an outdoor camera which connects to the indoor Wi-Fi unit with just a single cable. This allows for greater freedom when placing your camera outside. And it’s IP-66 rated for water & dust resistance with an anti-cut bracket. The indoor main unit also features a microSD card slot for storage. Edimax Plug-n-View technology makes it easy for you to keep an eye on your yard, garage, shop, factory or other assets wherever you go. With Plug-n-View technology, you can connect your network camera to the cloud in a few simple steps and access it remotely with a smartphone, tablet, or computer no matter where you are. With a light sensor, image sensor and 20 infrared LEDs, the IC-9110W is well equipped to meet outdoor security and surveillance needs - even in low-light and night-time conditions. And with automatic ICR (IR Cut Filter Removal), infrared light is filtered out during the day time (while allowed to pass at night) ensuring exceptional video color quality at all times. The powerful built-in motion detection system with pre-defined detection regions, offers peace of mind that you will capture any illicit activity. The network camera will produce video footage of the event immediately – storing the data on a microSD/SDHC card or sending it automatically via email or ftp. Supports push notifications with video alerts of events. When motion detection is triggered, the IC-9110W starts to record video clips to a microSD card and sends push notifications to your mobile devices, or sends email with event videos. The IC-9110W is built with a wide F2.0 lens which covers an impressive diagonal viewing angle of 108 degrees. With a megapixel CMOS sensor, the network camera is able to capture up to 720p (1280 x 720) videos at 30 frames per second. The IC-9110W outdoor case has a solid metal IP66-rated waterproof housing that protects the camera from dirt and rain. A wire-in bracket protects cables from damage or tampering and provides a clean installation. A built-in MicroSD/SDHC card slot supports cards up to 32GB for local storage and backup. *Minimum 8GB capacity microSD recommended. Less than 2GB capacity is not supported.